It’s been such an emotional year as we grappled with so many losses. One after another, favorite characters were taken from us suddenly. I’m looking at you: Orange is the New Black, Sleepy Hollow, and Westworld (waiting until 2018 for the next season feels like a death). There were bright spots, too. Thank you, Chris Harrison for a season of The Bachelor, which will make this the most superlative season yet! Maeve on Westworld is everything! 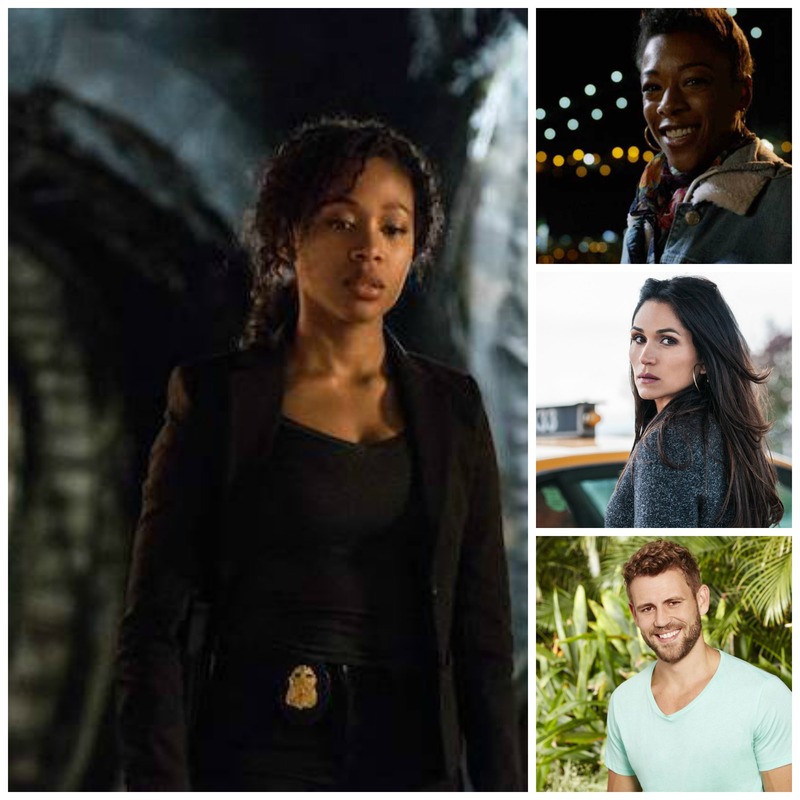 Here are some 2016 TV musings and shout-outs by and about our writers here at TVRD. White people – if you feel you need a black consultant to navigate the cultural divide, just watch Blackish. Here you will learn about “Black Twitter”, “the Nod”, ashy, and best of all, how your latent white guilt may have been activated without your even knowing it. Black people – I am sure you are dismayed that all of this got outed. You will have to talk to the showrunner about that – I am not succumbing to white guilt about it. But, there is a great episode on the science of instigating white guilt and reaping the rewards. Worth watching because a lot of white people still won’t have watched the show and will be completely unaware they are being manipulated. Meanwhile, I heard someone is thinking of launching a secret underground Black NASCAR – but keep it quiet. — Geri M.
From zero to hero: Seeing Nick go from villain, to super villain, to a sad little teddy bear, to a winner! At least I sincerely hope that Nick will leave his season of being The Bachelor with a woman by his side, but with his track record, there’s no guarantee. Tempting us with the Chad bear: Getting us all to watch Ben and Lauren: Happily Ever After? under the guise of Chad being on the show, only to find out he’s only featured for two minutes of one terrible, terrible episode. That trick cost me three hours of my life! Bachelorettes turned lesbian lovers: If I haven’t convinced you yet to branch out into the international Bachelors, this should do it. This year on Bachelor Australia, two of the women vying for The Bachelor ‘s heart fell in love and are now a couple! Frankly, if I had to date any of The Bachelors, I’d probably go lesbian too! — Andrée H.
3. Downton Abbey–Crawleys they’re just like Us! Except they have oodles of money and nothing to complain about. Thanks to a series of exclusive interviews, we learned that even English nobility have everyday issues. Why, even the haughtiest and most sought-after woman in the UK had a bad day once in a while. 4. Orange is the New Black–Nooooooooooo! Anything but this! Socially relevant, yes, but why did it have to be her? Couldn’t it have been Piper? Of course, not. That would have been as realistic as unicorns. It was a masterful illustration of what happens in a society in which “above the law” trumps decency. It was masterful. 5. Orange is the New Black–Well, okay you did a phenomenal job. Happy now? Despite the heartbreak of losing a beloved character, you honored that character and the audience. A lesser show might have just left us with the shock and moved on. Thank you for giving us a proper bittersweet farewell and using the death to set up the next season. That’s it. We just like saying that. Angie is so pretty. 7. Sleepy Hollow–Do we even have to say it? Our Bachelor philosopher and Canadian empress, Andrée took TVRD to a place we never dreamed of by sharing her views on The Bachelor franchise. Andrée, who is strong in her beliefs, used that irresistible Canadian charm to browbeat, gently encourage me to watch Bachelor in Paradise. She told me why it’s better than the main shows–and she was right. She was right for the right reasons. Thank you, Andrée. Would you accept this rose? Besides having a name scriptwriters would stab their moms to use, TVRD’s newest special contributor gets this one for voluntarily watching The Royals, a show which Elaine F. gave up on. Thanks, Savannah for bringing it back to life for us and recapping it in an enjoyable manner. He slips social statements into many of his Gotham and Ballers recaps. Ralph, a badass by day (as you’ll glean from his bio) brings his unique voice to TVRD. That voice suggests Ralph is not one to be trifled with. So watch your back! Tracey writes about American Horror Story and Fear the Walking Dead and still manages to sleep without a night light. That is an act of fearlessness rarely seen in today’s world. Wait, I think I just heard a noise in the basement, wanna go check it out for me? Who is Geri M.? Nobody knows. She has no bio and yet, she pops up now and then to weigh in before slipping off into the night. Some say she killed a man once, just to watch him die. Others say, she’s part of a secretive blog cartel. There’s a persistent rumor that she she only watches PBS. Whoever she is, we love her sense of humor. We made the leap from a recap site to a site with quotes from actual actors thanks to Val B. She took TVRD to the next level at a Warriors reunion. We’re proudly able to boast that we got a quote from an actor. If she has time, one day Val may provide us with another post with a quote. We aim high! In addition to being Executive Editor, TV Recaps was a stoic Sleepy Hollow widower. He never complained about Mrs.TV Recaps unhealthy obsession with a show that eventually stabbed her in the back. He was there to pick up the pieces. Oh my god this is the happiest day of my life, of course I accept your rose Looking forward to watching Nick’s journey continue next week! Still can’t think about Sleepy Hollow without wanting to spit. I have never actively wanted a show to fail, but…yeah. I hope season 4 blows up in their faces.